This story is by Rosemary Bunker who owned and managed this much loved bed and breakfast institution for many years. 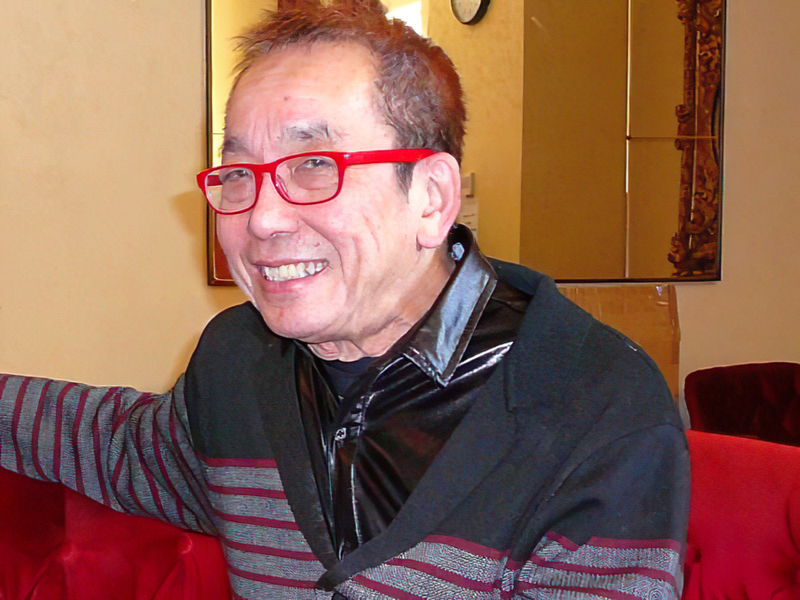 I arrived in Hobart in 1981 to teach drama at the University. 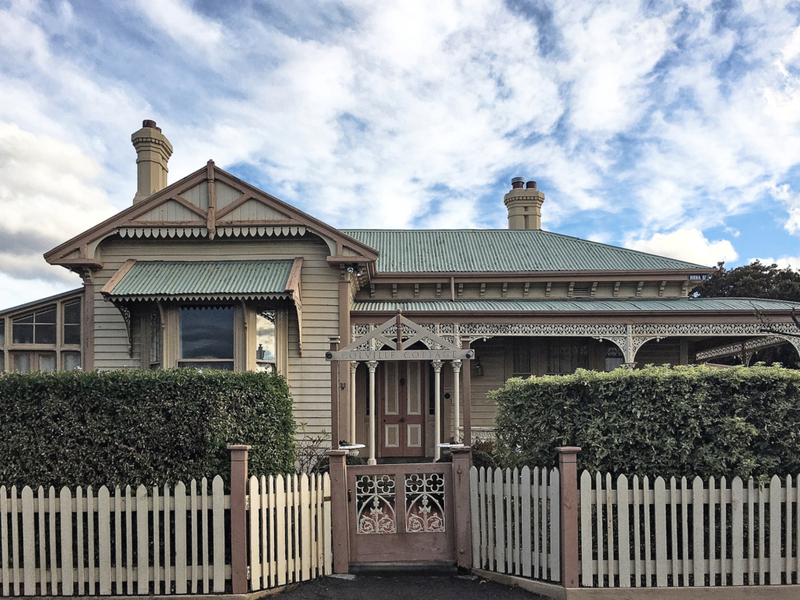 That first week in July I strolled around Battery Point looking for a house to buy and fell in love with the Victorian house on the corner of Colville and Mona Streets. It was quite unsuitable for a woman on her own having six rooms that went off the hall and another two at the back. The house became mine thanks to the Commonwealth Bank and circumstances conspiring to make the timing for a loan application perfect. 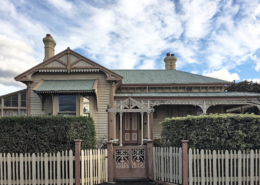 The Tasmanian government had directed banks to approve loans for the provision of tourist accommodation. Brian Yost, a sympathetic manager ahead of his time, approved the loan for a woman with no assets except her salary, on the condition the house became accommodation for tourists. 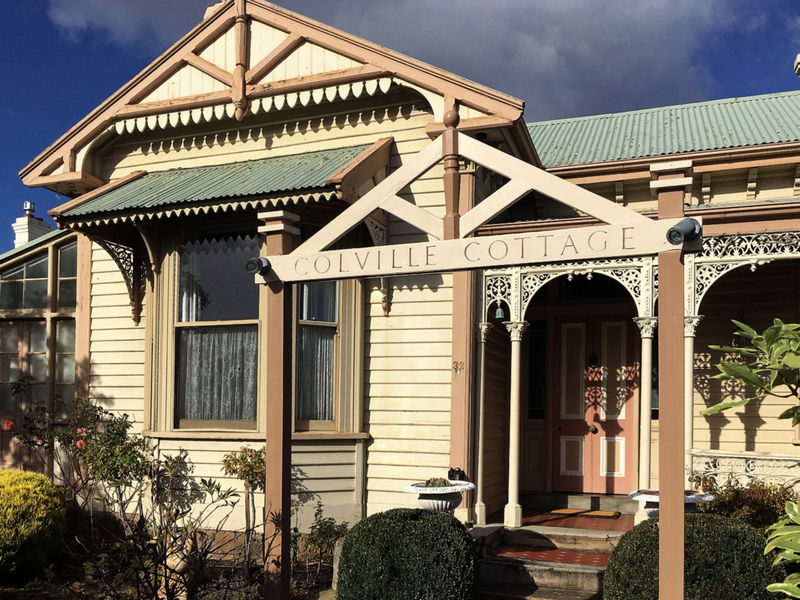 So Colville Cottage, the alliteration being more enticing to guests than Mona House, began a new life that lasted more than twenty years until it became a family home again. There were pressures in those early days. Motels were gearing up for the burgeoning tourist industry so competition drove changes. Soon guests were not satisfied with a bathroom down the hall or rooms that were not heated and cooled. The licensing inspector, appointed to ensure the industry met certain standards, insisted that clothes drying on the lines be invisible. ‘Guests do not want to see your dirty washing,’ he said. ‘My washing is clean,’ I replied. A lattice fence was erected around the laundry area to keep me out of trouble. ‘Your kitchen floor is not coved,’ he thundered on his next visit, sending me scurrying to the dictionary. And so the search for imperfection continued until I felt an accommodation licence would never be mine. Desperate, I phoned the Director of Tourism’s office. ‘What must I do to be perfect?’ I inquired. The Director himself came to morning tea, loved the old world ambience and granted an immediate accommodation licence. Honouring the original 1860s house while altering it became a particular pressure. 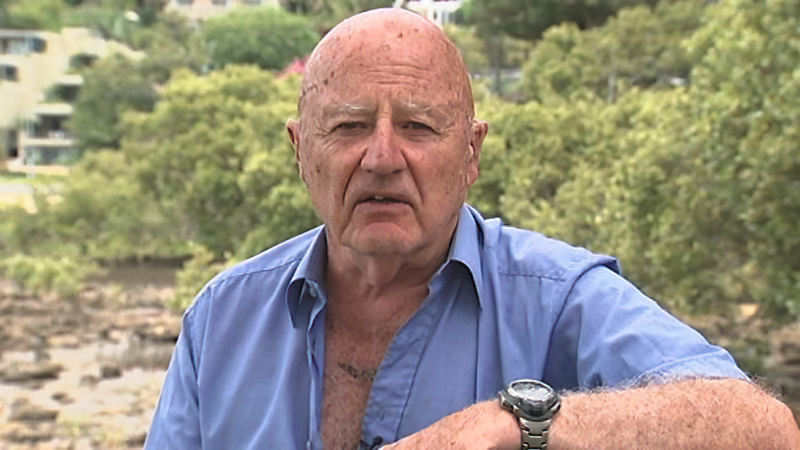 Gary Forward, the heritage architect, suggested innovative solutions; John Button gave practical advice; Prue Cotton’s expertise on wallpapers and curtains was invaluable; Mr. Freeman was a builder I relied on for workmanship and reliability. There were many experts, some of whose names I cannot remember, who contributed to the blossoming of the house. Some had been students at the art school and all had an aesthetic sense which I valued. 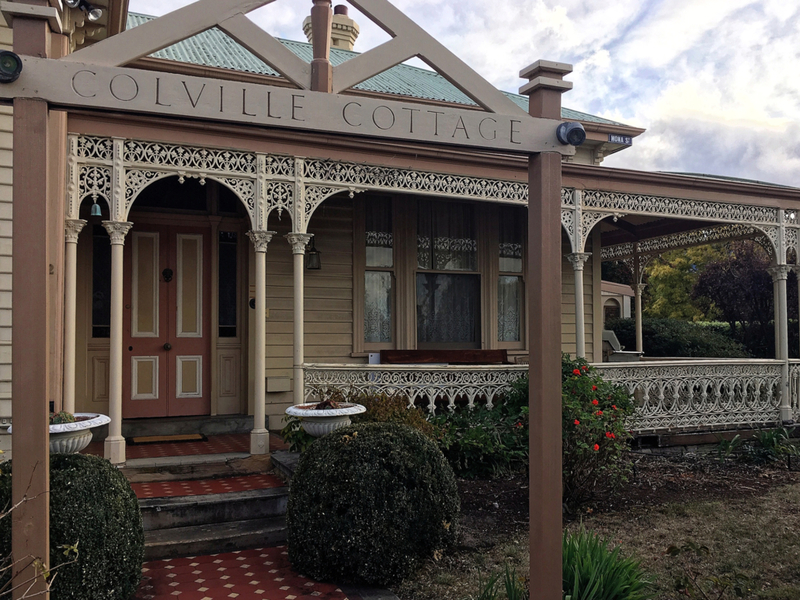 So the sign, Colville Cottage, was designed by a woman who understood wood , lettering and proportion. The gates were designed by a man who rescued two piers from an old wharf. They solid enough to support two wide gates he designed. The whole was a work of art, the blending of mathematics and design. To light the garden and hinder late-night toilet use by drinkers moving from Sandy Bay to Salamanca, Rick from Salamanca Antiques found a genuine Victorian lamp. Transporting, doing the lettering and erecting the light was the work of a couple of weeks. Antiques were not scarce in those days before visitors realised what a treasure trove of priceless antiques Tasmania harboured. Some of these were imported but there were Huon pine beds, linen presses and settlers’ chairs for the asking. 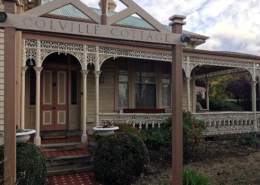 Cedar, mahogany and pine gave a special ambience to Colville Cottage as did Persian rugs purchased from the merchant who regularly visited from South Australia. Pat Cleveland’s Handmark Gallery, then in Hampden Road, had regular exhibitions of art by Tasmanian artists. Feeling a connection to the earth, I gravitated to the pots of` Derek Smith, Les Blakeborough, Shiga Shigeo and Geoff Minchin. Their work helped to establish the particular ambience of the house as did paintings by artists Paul Boam, Lloyd Rees, Max Angus, Joe Rose and George Davis. Guests made the cottage a vibrant place to be in the eighties. Many were regular guests who came to Hobart to visit family. Guests from the mainland and overseas came in growing numbers attracted by the scenery, the food and the history. 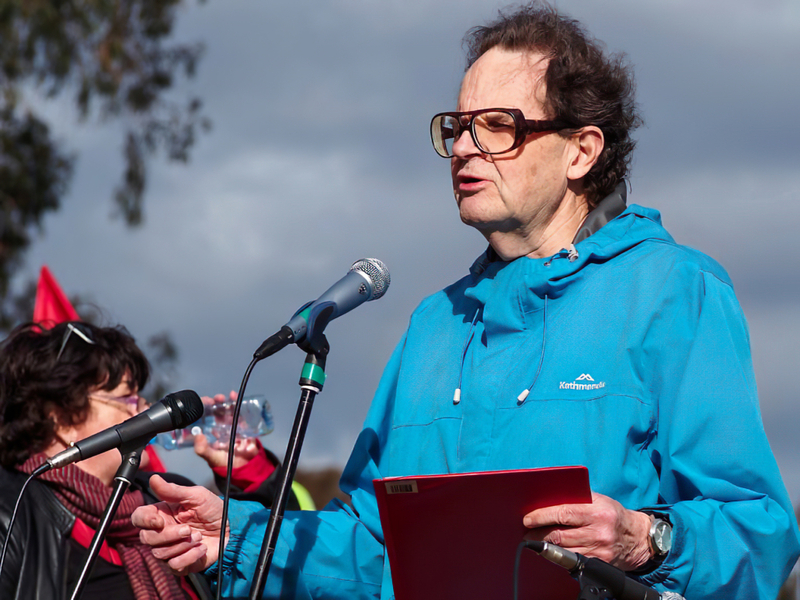 The yearly Writers Festival attracted crowds to hear well-known literary figures like David Williamson and Graham Swift, scientists like David Bellamy and nature-lovers like Eric Rolls as well as local identities like Margaret Scott and Richard Flanagan. 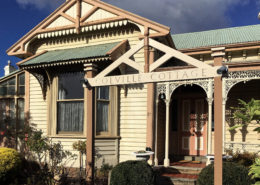 The cottage became a cultural hub for writers and artists who booked into Colville Cottage as did the Graham Murphy ballet dancers and arts administrators like Greg Leong. Humphrey McQueen stayed for two months to work on a book as did Evil Angels author John Bryson. The walls heaved for the tenth anniversary celebration of the B & B when a trio of young musicians wandered through the rooms and gardens. CC, the resident cat, joined in, moving nimbly between feet. The Mercury’s report of the event was accompanied by photographs of celebrants. The phone stood on an old King Billy pine desk in the kitchen and guests queued to use it. I installed an old red phone box by the back door to manage the demand. Guests would wait on the new verandah that linked the house and the back room. John Button supervised the building of this. Gary Forward gave advice on extensions to a couple of the internal rooms, the green and the gold rooms off the hall. The cottage garden, framed by the pittosporum hedge through which passersby peeped to glimpse the cottage was a special love of mine. Wisteria, heavenly blue and perfumed, climbed around the iron lace on the verandah. A crab apple tree, the source of fruit for herb jellies, and a rowan tree brilliant with red berries accented the two parts of the front garden. I accepted the challenge to rid the strawberry bed of oxalis. It took a couple of years. Violets bloomed under a tree fern by the house. A lemon tree bore lemons so prolifically I feared it might wear out. Old-fashioned pink roses bloomed inside the pittosporum hedge and there were shrubs like mock orange and guelder rose. Shirley poppies grew wild. The tamarisk, a rare kind I believe, waved its wands over the fence and was a picture of pink ‘lambstails’ when in flower. The garrya by the side gate was a favourite with its silver tassels as was the old mermaid rose over the kitchen window. Its blooms, shimmering gold, were the size of dinner plates with a paler centres. After seeing a peony in the Davis garden I knew the garden had to have one. It was a special moment the first year it bloomed. The crippling pilots’ strike of 1989 was almost the end of the B & B as it was of other businesses. All air traffic to the island stopped. The tourist industry dissolved. Teaching and bookings by Tasmanians kept the business alive as did the herb jellies made from a crab apple base and sold in Salamanca market. Action by Prime Minister Hawke began flights again to and from Tasmania and the tourist industry surged. The B & B lifestyle grew more and more exhausting over thirteen years. I sold it in 1994 and it continued as a business for some years before reverting to a family home.